Belonging to the chemical family of alkyl hydroperoxide, tert-butyl hydroperoxide (TBHP) is highly useful for various purposes for their properties of colorlessness, clarity, stability, and aqueous. TBHP has small threshold of reaction, is highly inflammable, and decomposes owing to contamination. A recent business intelligence study published by Transparency Market Research (TMR) has foreseen that the future of the global tert-butyl hydroperoxide market is getting gloomier but it still is bright enough to make moderate profits for the stockholders. The global market is estimated to reflect a revenue of US$136.41 million by 2025, with the demand expanding at a slugging CAGR of 1.3% during the forecast period of 2017 to 2025. The analyst of the report has highlighted that there is little but evident competition in the market for tert-butyl hydroperoxide, which has lost considerable stiffness in the recent past as a number of major players have shifted their businesses onto the alternatives that are showing greater prospects. Nevertheless, Akzo Nobel, LyondellBasell, Arkema Group, PERGAN GmbH, and United Initiators GmbH are a few players who still hold a notable position owing to their strong supply chain network and geographical presence. 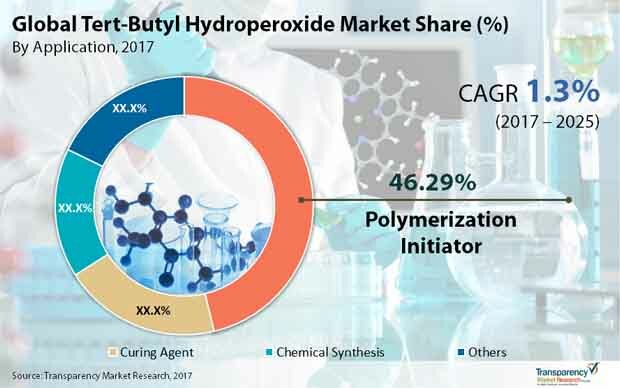 The key factor that is degrading the potential of the tert-butyl hydroperoxide market is its limited applications, while that of other alternatives are growing. A number of vendors have invest to gain proprietary technology for the manufacturing of PO that does requires the use of the chemical. Vendors are indulging in collaborations too, using each other’s expertise and developing innovative products. Based on application, the TMR report has segmented the tert-butyl hydroperoxide market into curing agent, chemical synthesis, and polymerization. Among these, the chemical synthesis and polymerization inhibitor segments are showing greater promise than the third. By the end of 2025, the polymerization segment is expected to generate an overall 46.61% of the demand, whereas curing agents will sustain its second position. Both these TBHP market segments are primed for a better than global growth rate during the forecast period, albeit very slightly. Geographically, the analyst of the research study has picked out Europe as the region that continues to constitute for the greatest chunk of demand, generating 40% of the overall demand as of 2016. Even in terms of volume, the European region is expected to remain prominent, with countries such as Belgium, Netherlands, and Germany leading the way. Tert-butyl hydroperoxide has three significant physical hazards, viz. decomposition as a result of contamination, thermal conductivity, and flammability. This chemical is widely available and acts well as a source of active oxygen that is ideal for different oxidation techniques. This chemical also finds application in the manufacturing of specific chemicals that need preciousness, such as agrochemicals and pharmaceuticals. On the other hand, the market is restrained due to the requirement of high capital for an adequate setup for this volatile chemical. Additionally, overtime, economic performance of operations fail to produce the desired results.